Sorted is running an exciting course, ‘Leading in community settings’. 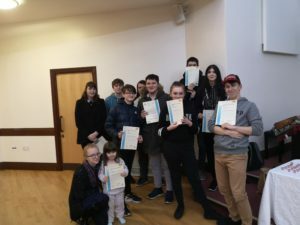 17 young people successfully completes the Bronze Award and are receiving their certificates. Sorted hosts an amazing evening, celebrating the hard work achieved by our young people. The course offers young people the opportunity to learn the skills required to be an empathic and informed leader in a variety of community settings. Sorted began life in 2003 in North Bradford with the simple aim of getting alongside young people, building relationships and empowering them to help us form new Christian communities.